Green home cleaning is an easy way to keep your family safe from toxic chemicals, while still getting your home clean. It's easy to build a housecleaning arsenal that is safe for your family and the environment. Using green cleaning products means you can rest easy, knowing that the manufacturing process for the cleaning products is environmentally friendly and the products are biodegradable. These 7 green home cleaning tips can help you create a cleaning cache that will reduce or eliminate harmful chemicals in and around your home. Natural soaps (castile or glycerin-based), to wash dishes. Distilled white vinegar is an excellent alternative to harsher cleaning products, especially when it comes to cleaning windows. 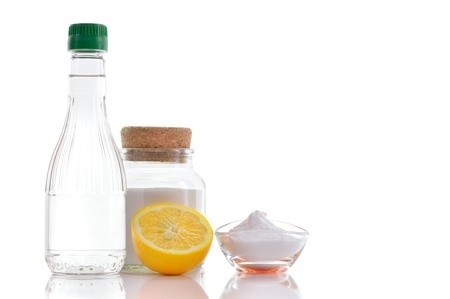 This homemade window cleaning mix is as effective as the store-bought variety: Mix 1/4 cup (60ml) of vinegar in 3 and 3/4 cups (900ml) of warm water. Vinegar is also a great disinfecting alternative to traditional bathroom cleaning products for the toilet bowl and tile floors. These 6 less toxic flea removal methods will keep your family and pet safe. If an ant invasion is the problem of the day, less toxic methods to stop them in their tracks include pour boiling water down the ant hole outside. Inside your home, these environmentally safe ant removal tips can help get the job done safely. Clean and rinse cleaning tools and equipment over your lawn or garden - not on paved surfaces or down indoor drains. Home drains and paved surfaces allow your cleaners to flow freely into waterways - something you want to avoid. Choose metal drip pans for use in the garage. You can move and clean these up safely. You can also soak up leaking car fluids with sawdust or cat litter. Then simply sweep it into a bag and put it in the trash. Plan to repair a leaking vehicle promptly to help keep fluids out of storm drains. And don't hose down the area to clean it up after making repairs. Anything washed off the ground and into gutter and storm drains enters local waterways untreated. This isn't good for any of us. Instead of setting up shop on a driveway or street where soapy water may flow directly into a storm drain, wash your car on a lawn or unpaved surface. This keeps soapy water from flowing into street drains and out to our oceans. Choose latex paint when you're touching up surface paint around the house. This water-soluble paint makes paint thinners and solvents unnecessary. Whatever type of paint you're using, however, always cover the brushes at night when a job is in progress. Wait to do that thorough water wash for when the job is complete. Clean latex paint from brushes and containers in the sink; filter, settle, and reuse thinners and solvents for oil-based paints. Remember to dispose of unusable paints and thinners, thinner residue, and paint strippers, at a household hazardous water collection site in your community.